Window blinds is a great option for improving the look of interior while making your room more relaxing. This is why Impress Blinds brings a widest assortment of high quality and cheap window blinds at great prices to help you get the best covering solution for your Preston home. Having significant experience in the window blinds and shades industry, we have been supplying and fitting made to measure blinds in Preston, Greater Manchester and all over the UK. Our inspiring collection of window blinds includes stunning vertical blinds, roman blinds, wood blinds, venetian blinds, roller blinds and vision blinds. 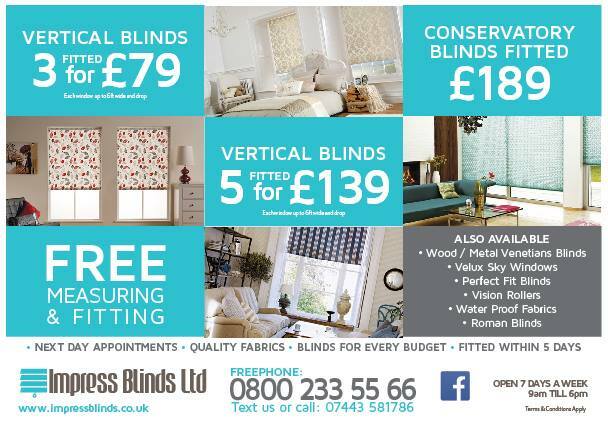 We offer you the cheapest blinds rate but we don’t compromise on the quality of our products and services. We supply and install bespoke made to measure blinds made up of high quality British material that comply with all new standards and regulations. So, we provide you the solution that is durable, child safe and eco friendly. This is why impress Blinds is one of the best supplier of window blinds in Preston and over the UK. We have hundreds of thousands of domestic and commercial clients in Preston (Greater Manchester) and all over the UK who are much satisfied with our products and services. As a part of our complete service, we also offer free advice, measuring and fitting services to all our valued clients in Preston, greater Manchester area across UK. From start to finish, our efficient team will assist and work with you to make sure you are happy and satisfied. We are committed to providing the best of products and services to all our clients not only in Preston but all over in UK. Benefit from our supper offers and buy 3 roller blinds for £119 and 3 vertical blinds for £79 along with free measuring and fitting services.